Here are some of the postcards I've made for my grandsons. You will need PelTex Fusible Stabilizer for the body of the postcard. I mail my postcards inside an envelope to keep all of the attachments from coming off. Below you can see some of the things I use on my postcards. I have stamp pads in several different colors and lots of different stamps. 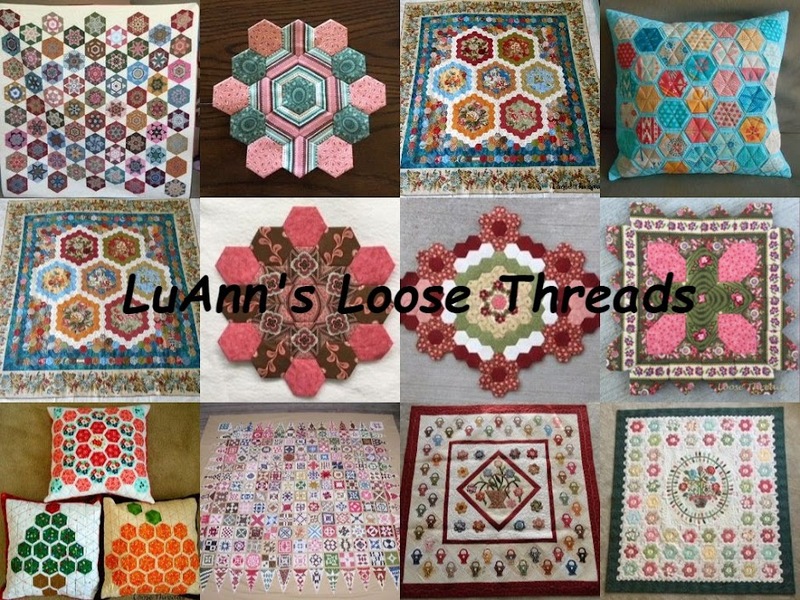 I buy things to use at JoAnn Fabrics, dollar stores, quilt shows or wherever I see something that I might be able to use. I have a stamp that looks like the back of a post card. Be sure to do all of the sewing on the postcard before you put this on your postcard. Otherwise all of the sewing lines from the front will show through. Here is a look at the stamp that I use for the postcard back. Instead of a postage stamp, I use the kitty cat stamp. Here are the things that I used to make the Christmas post card. I start with a piece of fabric on top of the Pel Tex (available at fabric stores). I fix it to the PelTex with a bit of glue or just sew around the edge. I laid the items out to see if they are all going to fit on the card. In the photo below, the rick-rack and the deer are held on by machine sewing. The Santa and tree have adhesive on the back, but I glue them to be sure they don't come off. The Christmas lights came from the dollhouse section of a fabric shop. 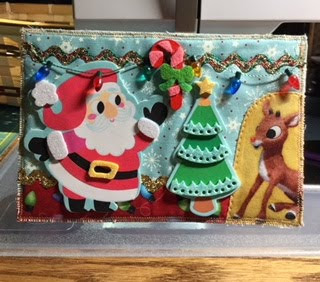 When you are finished with this side of the card and the address side, do a zig-zag stitch around the outside of the card just to give it a nice finished edge. Here is the finished Christmas card. 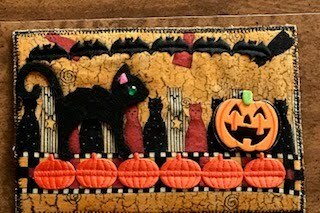 Here are some of the things I use for Halloween post cards. I start with a piece of Halloween fabric and just build the card using the things below. The washi tape can be found at most craft stores. 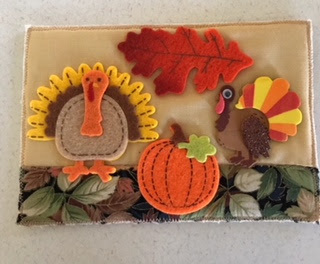 This piece of fabric made the card easy to make. I glued the string of bats at the top and the pumpkins at the bottom. Here is the finished postcard. I did a zig-zag stitch around the edge of the card after finishing. I hope you will try making your own postcards. The grandchildren love them, but they are also great to send to friends as a thank you or birthday card.